Background: There is very limited information available on HIV related orphans and vulnerable children (HIV-OVC) in Myanmar. Hence, the objective of this study was to identify and compare the social, education and health consequences among HIV-OVC and children from the families not related to HIV in the same neighbourhoods (neighbouring children). Materials and Methods: A cross-sectional, comparative survey was carried out in three geographical locations. Face-to-face interviews were conducted with guardians and children using a pretested structured questionnaire including Strength and Difficulties Questionnaire (SDQ) for behavioural problems. Outcome measures were compared using Chi-squared test or 't' test or 'Rank-sum' test. Results: A total of 300 HIV-OVC and 300 neighbouring children were included. A greater number of HIV-OVC than their neighbouring children have experienced family displacement from their original homes (27% and 1%), child/sibling displacement (20% and 2.7%) and family dispersion (20.3% and 1.3%) (P < 0.001). More guardians of HIV-OVC reported that the disease affected their children's education (28.2% and 16.3%; P < 0.05). Fifteen per cent of HIV-OVC and 10.5% of neighbouring children had to work for their families (P < 0.05). Psychological condition was assessed on emotional, conduct, hyperactivity/inattention, peer relationship and prosocial behaviour. A greater number of HIV-OVC were noted in the abnormal category with regard to hyperactivity and prosocial behaviours (P < 0.05). Conclusions: Higher incidence of social and psychological consequences among HIV-OVC call for more community support programmes and creation of job opportunities to minimize social impact in the affected families. Future programmes should focus on counselling of HIV-OVC and providing psychological support. Even with the expansion of access to antiretroviral treatment, it is estimated that, by 2015, the number of orphaned children will still be overwhelmingly high. The number of orphans in some sub-Saharan African countries exceeds 1 million, and, in some countries, children who have been orphaned by AIDS comprise half or more of all orphans nationally. Most of the AIDS orphans who live outside of Africa live in Asia, where the total number of orphans (orphaned for all reasons) exceeds 73 million. The problems faced by AIDS orphans include emotional impact, household impact, educational impact and stigmatization. ,,,, HIV/AIDS has many direct and indirect impacts on children's rights, ranging from the consequences of psychological impact of losing one or both parents, to reduced access to quality education and health services. , Children's rights to survival, health, development and education as well as protection from economic and sexual abuse have been threatened by the HIV/AIDS epidemic. Previous studies focusing on HIV/AIDS orphans in China and Africa have highlighted the psychological problems ,, and problems of unmet basic needs such as food inadequacy, discontinuation of schooling and inaccessible healthcare services  faced by the orphans. Myanmar is one of the countries afflicted by HIV/AIDS similar to other developing countries in South East Asia. According to the National AIDS Programme (NAP), the adult HIV prevalence is about 0.61% in Myanmar. Limited information is available for orphans and vulnerable children (OVC) due to AIDS in Myanmar. A previous qualitative study on HIV/AIDS orphans acknowledged that there were adverse socioeconomic consequences such as school discontinuation, family dispersion, effect on a family's economy and stigma/discrimination. However, the study could not identify the extent of these consequences. Therefore, this study aimed to explore the situation and extent of social and psychological health consequences faced by OVC due to HIV/AIDS (HIV-OVC). The objectives of this study were to identify and compare the social situation, educational condition and psychological and health status of OVC due to HIV/AIDS (HIV-OVC) with that of children from the families not related to HIV in the same neighbourhoods (neighbouring children). A community-based, cross-sectional, comparative study was carried out in North Okkalapa, Monywa and Tachileik Townships. These townships were selected specifically because of a high prevalence of HIV/AIDS and presence of community-based activities focusing on HIV/AIDS. According to a 20% anticipated difference of study outcomes between two groups, a ratio of HIV-OVC and neighbouring children to be 1:1 and an 80% power to detect this difference, at least 98 children from each group were required. Therefore, a total of 196 children were needed in each township. HIV orphans were defined as the orphans who were younger than 18 years and have lost one or both parents due to AIDS. Vulnerable children were defined as those who have HIV-positive parent (s). Age group-matched neighbouring children from the same area were considered during the selection of the comparison group. If one HIV-OVC was selected as the study sample, one control child of the same age (±6 months) who lived in the same street/village was also chosen. A list of HIV-OVC was compiled from different sources, and it was checked for duplication by identifying their name, age, parents' name and address. Next, required samples were obtained through simple random sampling. Children from both urban and rural areas were included in each township. The survey team visited 10-20 wards in urban areas and 15-25 villages in rural areas, according to the random selection from the sampling list. After developing a structured questionnaire, a pretest was carried out in a nonproject township. A reliability test was performed for Strength and Difficulties Questionnaire (SDQ) and the Cronbach-alpha value was 0.7 for all items (range: 0.6-0.7 for each '5' items scale). SDQ , is a brief behavioural screening questionnaire for emotional and behavioural disorders in children and adolescents aged 4-16 years. The SDQ consists of 25 items: emotional symptoms (5 items), conduct problems (5 items), hyperactivity/inattention (5 items), peer relationship problems (5 items) and prosocial behaviour (5 items). Responsible persons from the NAP, local and international nongovernmental organizations (NGOs) either working with HIV/AIDS orphans or people living with HIV/AIDS (PLHIV) in the study townships were contacted. These organizations were informed about the objectives of the study and were invited to attend the advocacy meeting, which was held in each township before field data collection. Face-to-face interviews were carried out by using a pretested structured questionnaire, which consisted of two parts. The first part was for guardians and the second part was for children. If the child was younger than 10 years, the guardians responded to both the parts. Face-to-face interviews were also undertaken with guardians/care takers for SDQ questions. Data entry and data analysis were done using EpiData software (version 3.1; EpiData Association, Denmark) and R software (version 2.9.1; R foundation for Statistical Computing, Austria). Responses to psychological questionnaires were assigned a score ranged from '0' to '2'. according to the direction of the statement. Next, composite scores were calculated and categorized as 'normal', 'borderline' and 'abnormal'. Descriptive statistics were shown as percentages for categorical variables and mean/median for continuous variables. Outcome measures were compared between two groups using Chi-squared test for categorical variable and 't' test or 'Rank-sum' test for continuous variables. The proposal was approved by the Institutional Ethical Review Committee of Department of Medical Research (Lower Myanmar). Written informed consents were obtained from the guardians after detailed explanation about the study. To ensure confidentiality, only code numbers were mentioned on the questionnaires and interview records. A total of 600 respondents were included in the study. Among them, 300 children were HIV-OVC and the remaining 300 were their neighbouring children. The ages of the children ranged from 1 month to 17 years with a median of 8.5 years. Among them, 24% were aged 1 month to 5 years, 44.3% were 6-10 years and 31.7% were older than 10 years. Males and females constituted approximately the same proportion (50.5% and 49.5%, respectively). Less than half (43.3%) of the HIV-OVC have both parents alive, while 17.3% of HIV-OVC were double orphans, 28.3% were paternal orphans and 11% were maternal orphans. Moreover, about two thirds (63.7%) of fathers and 85% of mothers were HIV positive. One third (33.0%) of HIV-OVC and 27% of neighbouring children were staying with extended family members. The age of the guardians, including parents, also ranged from 17 to 78 years, with a mean age of 39.5 years. Distribution of the occupation and education of the head of the household was similar in both groups; about half of them were manual labourers (42% of HIV-OVC and 50% of neighbours) and about one fourth (25% and 28%, respectively) of them has passed middle school. Median monthly family income was lower in the HIV-OVC group than in the non-HIV group (80 000 and 96 000 Kyats, respectively) (P < 0.001). This study focused on social situation such as displacement from original homes 1 , sibling/child displacement 2 and family dispersion 2 , which are illustrated in [Table 1]. All three conditions were significantly higher in HIV-affected families than in non-HIV families. A significant difference was detected for family displacement, where 27% of the HIV affected families were displaced from their original homes either within the same township or to other townships (P < 0.001). Similarly, higher proportions of child displacement (20% vs 2.7%) and family dispersion (20.3% vs 1.3%) were seen for HIV-OVC than non-HIV families (P < 0.001) [Table 1]. Education and work-related characteristics of the children are shown in [Table 2]. Currently, more than 80% of both HIV-OVC and related children without HIV have been attending school. Higher proportions (28.2% vs. 16.3%) of guardians of HIV-OVC stated that HIV status of parents affect their children' education. Specifically, the different types of effects on education included school drop-outs, school absenteeism, inability to pay school expenses, moved to another school and delay in school enrolment. Regarding the work-related characteristics, 15% of HIV-OVC and 10.5% of non-HIV-related children had to work for their families (p<0.1) and their monthly income ranged from 0 to 96 000 Kyats [Table 2]. [Table 3] describes the psychological status of the children, which was measured using a standard behavioural questionnaire (SDQ). Each of the 25 items is scored on a 3-point scale ('0' = 'not true', '1' = 'somewhat true' and '2' = 'certainly true'), with higher scores indicating greater problems. Contrast is true for prosocial behaviour. Next, the total difficulties score was calculated by adding emotional, conduct, hyperactivity and peer relationship problems. Higher total scores were seen in abnormal behavioural problems. The mean total difficulties score was significantly higher among HIV-OVC than among non-HIV-related children (P < 0.05). The total number of children in the two groups was '272' and '274' since SDQ questions were only for the children aged between 4 and 16 years. 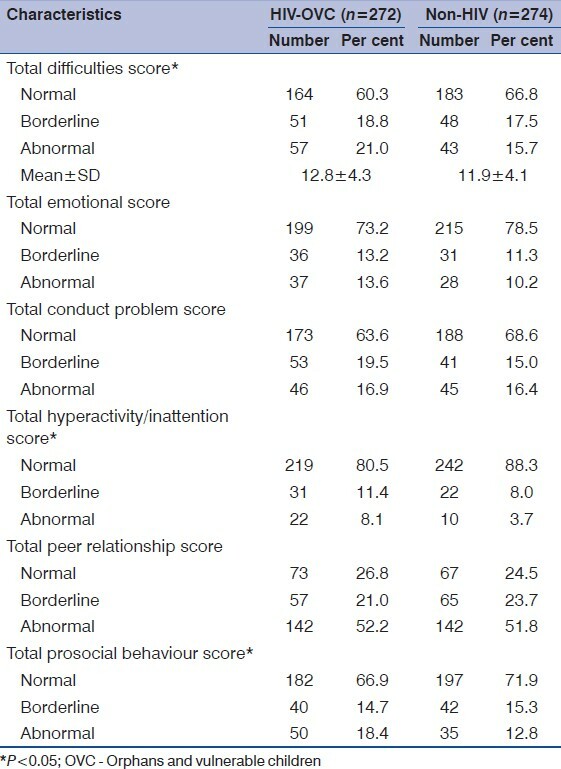 Next, the total scores were categorized as 'normal', 'borderline' and 'abnormal' behaviour. Significant differences were detected between the two groups for hyperactivity and prosocial behaviour (P < 0.05). However, similar patterns of behavioural conditions were seen for other attributes. 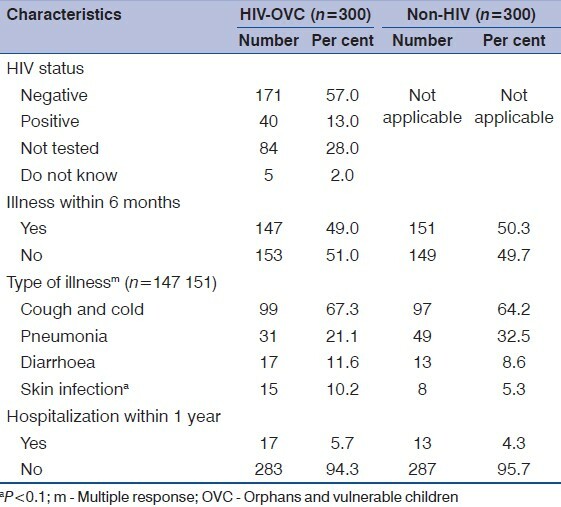 An abnormal total difficulties score was seen in 21% of HIV-OVC and 15.7% of non-HIV-related children (P < 0.05) [Table 3]. Health-related characteristics are shown in [Table 4]. Of the 300 HIV-OVC, 40 children (13%) were HIV positive, in which 16 (40%) had already received antiretroviral therapy (ART). Among the HIV-positive children, 45% were aged 5 years or younger. Nearly half of the children had a history of illness within 6 months. Most common illnesses included cough and cold, pneumonia, diarrhoea and skin infection. A greater number of HIV-OVC children experienced skin infection than non-HIV-related children (10.2% and 5.3%, respectively) (P < 0.1). Besides illness within 6 months, 5.7% of HIV-OVC and 4.3% of normal children had a history of hospitalization within 1 year [Table 4]. The present study identified and compared the social, education, psychological and health conditions of HIV-OVC and children from the non-HIV related families in the same neighbourhoods. Significant differences in social conditions such as family displacement from their original homes, child/sibling displacement and family dispersion were detected between HIV-OVC and neighbouring children. A higher proportion of HIV-OVC than their counterparts had experienced the aforementioned social consequences after their parents died or were infected with HIV. In particular, 27% of HIV-OVC from the current study had experienced family displacement from their original homes. This was much lower than in a study carried out in Zambia where 61% had moved from their original homes. These kinds of social consequences were mostly linked with financial hardship faced by the affected families. Moreover, a few families moved to places where they could get support from different national and international non-governmental organizations (NGO/INGOs). Significant social consequences among HIV-affected families could have a psychological impact on children. Surprisingly, findings from the current study revealed that more than half of the children from both the groups had peer relationship problems, which was also reported from Africa. However, in Thailand, no difference was detected regarding behavioural problems among HIV-affected pre-school children in comparison with their controls. Higher proportions of HIV-OVC than non-HIV-related children from the current study had high risk of developing behavioural problems in adult life. This study data highlight that there were adverse social and psychological consequences faced by HIV-affected families, and more attention should be paid towards psychosocial support for HIV-OVC in addition to material assistance. Development of community support programmes and creation of job opportunities are needed to minimize social impact among the affected families. Counseling of HIV-OVC and psychoogical support focusing on children's behavior should be strengthened to minimize the risk of behavioral problems and part-time formal education programmes for working children should be expanded. This study was funded by UNICEF, Country Office in Myanmar. A family displaced from their original house to another place. A child displaced from his/her family to another house/place. Family members dispersed to different places. 1. Joint United Nations Programme on HIV/AIDS. Global report: UNAIDS report on the global AIDS epidemic 2010. Geneva: UNAIDS, 2010. Available from: http://www.unaids.org/globalreport/ [Last accessed on 2013 Apr 14]. 2. Joint United Nations Programme on HIV/AIDS. Global report: UNAIDS report on the global AIDS epidemic 2008. Geneva: UNAIDS, 2008. Available from: http://www.unaids.org/en/dataanalysis/knowyourepidemic/epidemiologypublications/2008reportontheglobalaidsepidemic/ [Last accessed on 2013 Apr 14]. 3. UNICEF. Children and AIDS: fifth stocktaking report, 2010. New York: UNICEF, UNAIDS, WHO, UNFPA and UNESCO, 2010. Available from: http://www.unicef.org/publications/index_57005.html [Last accessed on 2013 Apr 14]. 4. UNICEF. Africa′s orphaned and vulnerable generations: children affected by AIDS. New York: UNICEF, UNAIDS and PEPFAR, 2006. Available from: http://www.unicef.org/publications/index_35645.html [Last accessed on 2013 Apr 14]. 5. Atwine B, Cantor-Graae E, Banjunirwe F. Psychological distress among AIDS orphans in rural Uganda. Soc Sci Med 2005;61:555-64. 6. Monasch R, Boerma JT. Orphanhood and childcare patterns in Sub-Saharan Africa: An analysis of national surveys from 40 countries. AIDS 2004;18 Suppl 2:S55-65. 7. Akwara PA, Noubary B, Lim Ah Ken P, Johnson K, Yates R, Winfrey W, et al. Who is the vulnerable child? Using data to identify children at risk in the era of HIV and AIDS. AIDS Care 2010;22:1066-85. 8. Coombe C. Mitigating the Impact of HIV/AIDS on Education Supply, Demand and Quality. In: Giovanni AC, editor. AIDS, Public Policy and Child Well-Being. 2 nd ed. Florence: UNICEF Innocenti Research Center; 2007. 9. Cornia GA, Patel M, Zagonari F. The impact of HIV/AIDS on the health system and child health. In: Giovanni AC, editor. AIDS, Public Policy and Child Well-Being. 2 nd ed. Florence: UNICEF Innocenti Research Center; 2007. 10. International HIV/AIDS Alliance. Building blocks: Asia: briefing notes for communities working with orphans and vulnerable children. Brighton, 2006. Available from: http://www.hivpolicy.org/Library/HPP000764.pdf [Last accessed on 2013 Apr 14]. 11. He Z, Ji C. Nutritional status, psychological well-being and the quality of life of AIDS orphans in rural Henan Province, China. Trop Med Int Health 2007;12:1180-90. 12. Zhao G, Li X, Fang X, Zhao J, Yang H, Stanton B. Care arrangement, grief, and psychological problems among children orphaned by AIDS in China. AIDS Care 2007;19:1075-82. 13. Makame V, Ani C, Grantham-McGregor S. Psychological well-being of orphans in Dar El Salaam, Tanzania. Acta Paediatr 2002;91:459-65. 14. Myanmar, Ministry of Health, Myanmar. HIV estimates and projections Myanmar 2008-2015. Yangon: National AIDS Program, WCO, UNAIDS, 2012. Available from: http://www.aidsdatahub.org/dmdocuments/Myanmar_HIV_estimates_and__projections_2008_to_2015.pdf [Last accessed on 2013 Apr 14]. 15. Myo MM, Saw S, Yin TN, San H, San SA, Pyone TN, et al. Socio-economic and health consequences among HIV/AIDS affected families and orphans in Hlinethaya Township. Myanmar Health Sci Res J 2011;23:65-71. 16. Nyamukapa CA, Gregson S, Lopman B, Saito S, Watts HJ, Monasch R, et al. HIV-associated orphanhood and children′s psychosocial distress: Theoretical framework tested with data from Zimbabwe. Am J Public Health 2008;98:133-41. 17. Goodman R. The strengths and difficulties questionnaire: A research note. J Child Psychol Psychiatry Allied Disc 1997;38:581-6. 18. China National Commission of Next Generation. A survey of AIDS orphans in seven counties. CNCNG, 2003. Available from: http://news.xinhuanet.com/newscenter/2003-12/01/content_1206049.htm [Last accessed on 2013 Apr 14]. 19. Ardington C, Leibbrandt M. Orphanhood and schooling in South Africa: Trends in the vulnerability of orphans between 1993 and 2005. Econ Dev Cult Change 2010;58:507-36. 20. Doku PN. Parental HIV/AIDS status and death, and children›s psychological wellbeing. Int J Ment Health Syst 2009;3:26. 21. Fang X, Li X, Stanton B, Hong Y, Zhang L, Zhao G, et al. Parental HIV/AIDS and psychosocial adjustment among rural Chinese children. J Pediatr Psychol 2009;34:1053-62. 22. Cluver L, Gardner F. The psychological well-being of children orphaned by AIDS in Cape Town, South Africa. Ann Gen Psychiatry 2006;5:8. 23. Sanmaneechai O, Puthanakit T, Louthrenoo O, Sirisanthana V. Growth, developmental, and behavioral outcomes of HIV-affected preschool children in Thailand. J Med Assoc Thai 2005;88:1873-9.